Three suicide bombers opened fire at Istanbul airport and then blew themselves up; all Israelis accounted for. Turkey's Prime Minister, Binali Yildirim, said Tuesday night that 41 people and three suicide bombers died in the attack at Istanbul's Ataturk airport. 140 people were wounded in the attack at the airport, which is located just outside of Istanbul. Yildirm said that so far all indications point to the Islamic State (ISIS) group being behind the attack, adding the attackers arrived at the airport in a taxi and blew themselves up after opening fire. He added the victims include some foreigners and that many of the dozens wounded have minor injuries but others are more badly hurt. The Foreign Ministry in Israel said there is no indication that any Israelis were injured. Israeli passengers who were stranded at the airport following the attack were taken to nearby hotels until flights are renewed on Wednesday. The Foreign Ministry has opened an emergency hotline at +972-2-5303155. Turkish officials have confirmed that two suicide bombers detonated their explosives in the attack. The attack took place in the international departures area, according to CNN. Gunfire also heard at the site was from Turkish security forces attempting to stop the bombers, officials added. In the confusion, some witnesses had told Reuters they saw gunmen open fire from an airport car park. As with previous attacks, the Turkish government has placed a media blackout on Turkish outlets reporting the attack. Footage has emerged apparently showing terrified commuters taking cover at the airport in the aftermath of the bombings. 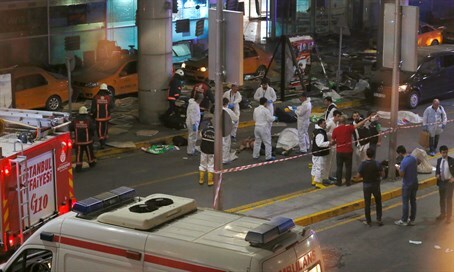 Turkey has in recent months been targeted with deadly attacks by terrorists from the Islamic State (ISIS) jihadist group - including suicide bombings - as well as smaller-scale attacks by left-wing extremists. On Wednesday morning, Turkish officials said they believe ISIS was behind the attack.